My take on a Tube Screamer. 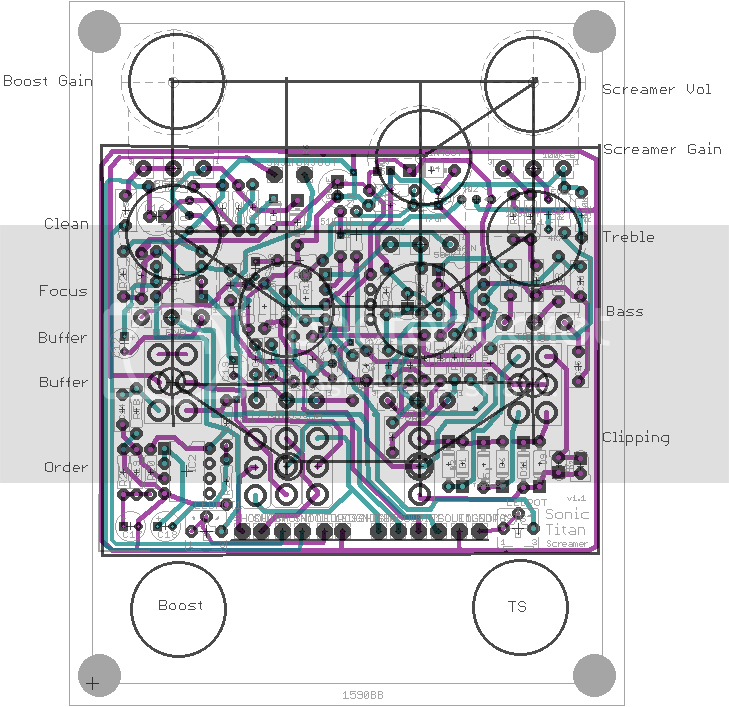 Started with a TS808 base and added some of the features I would like to see on a Screamer. 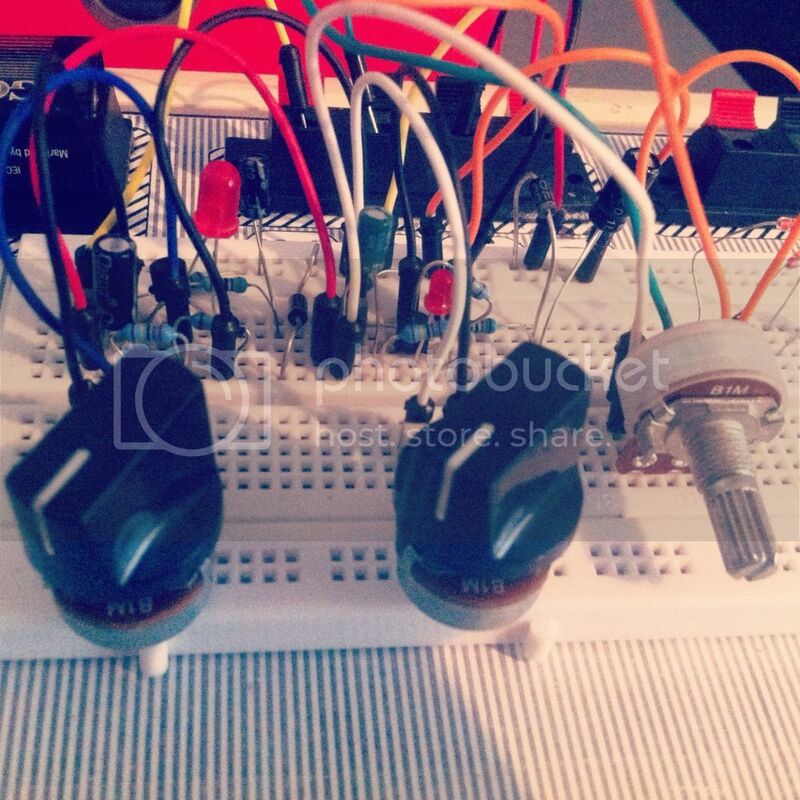 As for the Boost section, I'm still playing with the SHO type boost on breadboard. It'll be fairly different by the time I'm done with it. Love that sparkle and clarity of the MOSFET. Will post a bit for info when time permits but currently exhausted as just spent the whole day becoming officially "employed". 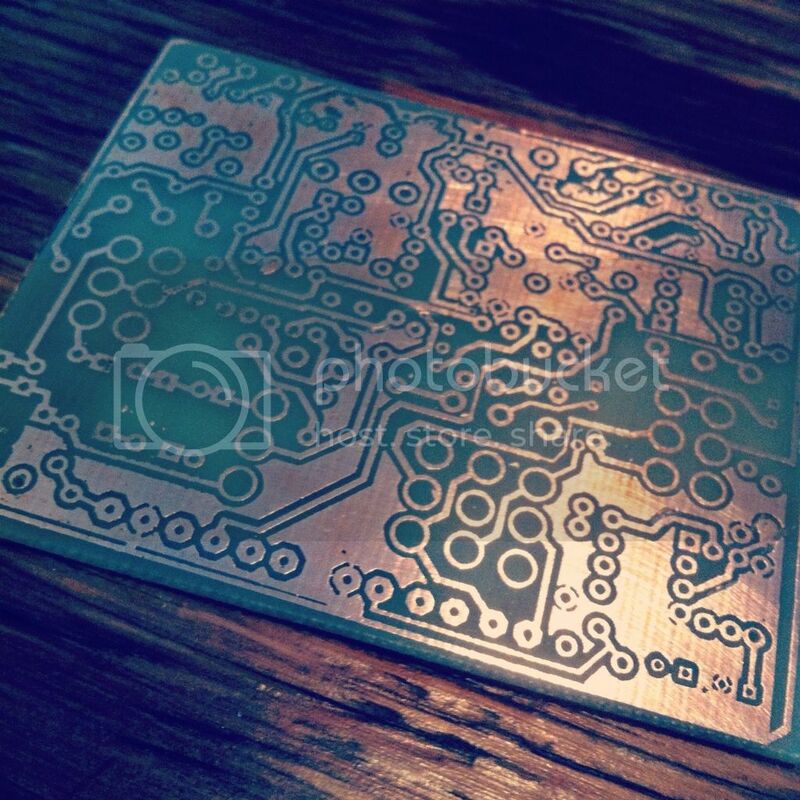 Will be building a prototype over next day or two - first time I'll be etching a double sided board. Also if anyone knows anything about laser engraving, please PM me or help a brutha out by posting. No idea where to start! Aside from the awesome pedal, just wanted to say congrats on your employment. I assume you'll be doing articles? Which firm? Signed with Deloitte in JHB. Will be cool to follow this one. No connection I'm afraid, first I've seen that actually! 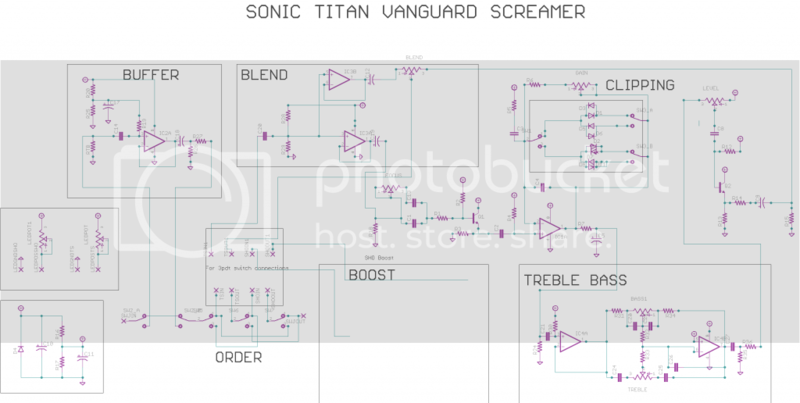 There's actually a pedal made by DAM called the "Sonic Titan", also non-related. Yep, for the next 3 weeks I'm a free agent with 1 purpose - pedal awesomeness. Mattocaster wrote: No connection I'm afraid, first I've seen that actually! I'm very interested to see what awesomness you come up with in those three weeks. These builds are impressive. Yep still quite undecided on the name. 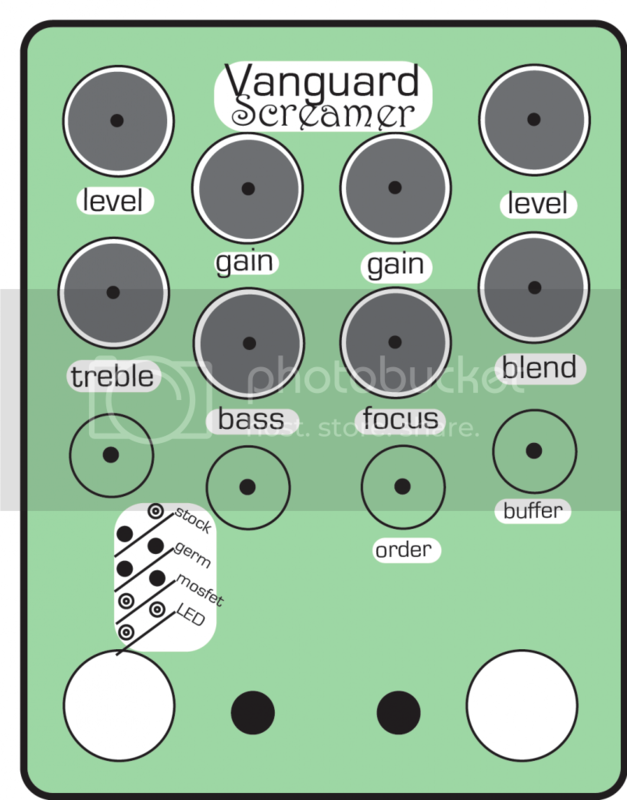 Chose Vanguard mainly because I made the controls in kind of a "V" shape. Open to any suggestions for a name? I still rate Sophie Screamer It just sounds right! 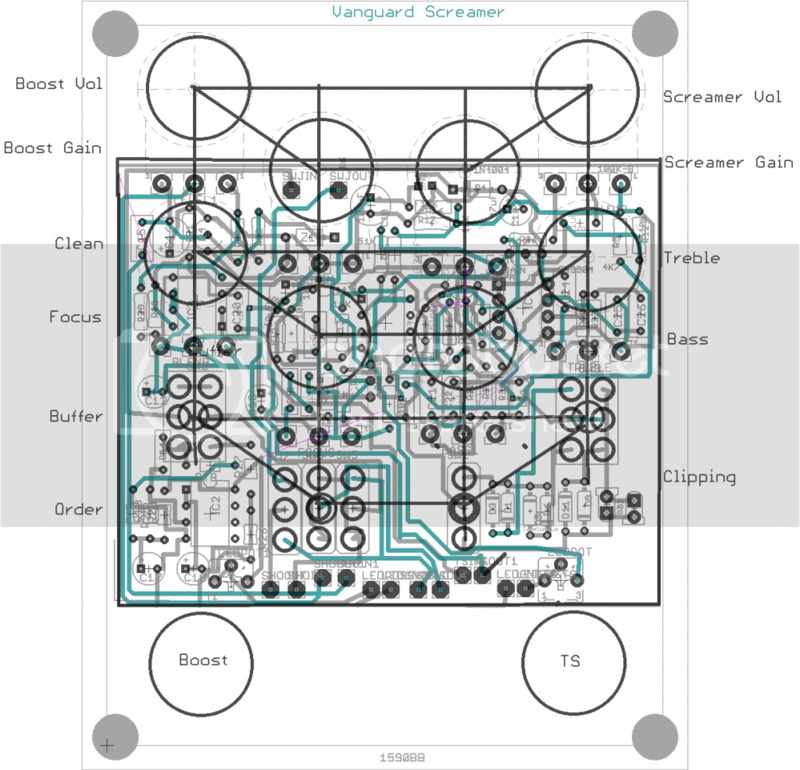 And if this pedal becomes a reality you can bet your left leg i want one! Some progress with the boost section. Uses a single MOSFET gain stage like the ZVex SuperHardOn boost (my personal favourite boost and benchmark). Retains the amazing clarity and sparkle while eliminating the "crackle" on the Gain pot. Check out a YouTube vid of the "crackle" - as you turn the Gain pot you get awful crackle. ZVex uses it to his favour and was likely done intentionally ie if it crackles you know it's a ZVex SHO. But I personally think its quite unnecessary. Actually 2 gain stages on the breadboard, and get some nice distortion, but not necessary as a clean boost. Board layout is officially done. And I now have square eyes from staring at the computer screen for the past 127 hours. Quite happy with the boost section. Lots of sparkle. Nothing I tried on breadboard gave me slight dirt I was looking for - it was either crystal clear or overdriven. So now there's just a "Boost" knob. 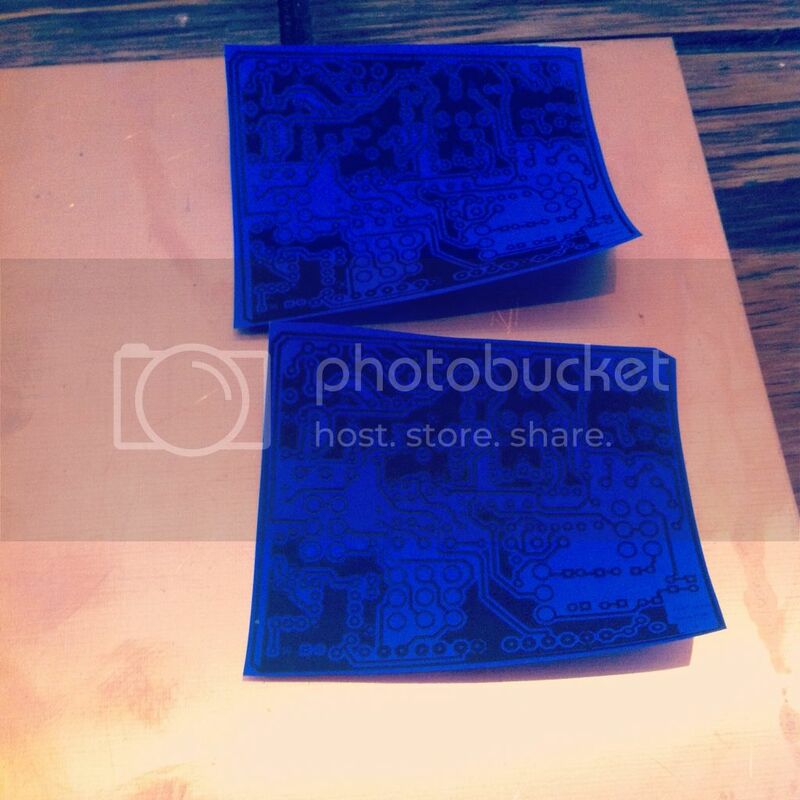 Gonna try etch this double sided board tomorrow. Don't feel like waiting 3 weeks for a fabricated prototype to arrive. If it works first time without troubleshooting I think I'll pass out. It worked first time with the Skeedish Muff - it's like seeing a Double Rainbow. Isn't the "crackle" on the gain a part of the circuit? I have vague memories of one of the classic transistor boosters (Rangemaster maybe?) that fans say is only right if it crackles when the pot is turned. Alan Ratcliffe wrote: Isn't the "crackle" on the gain a part of the circuit? I have vague memories of one of the classic transistor boosters (Rangemaster maybe?) that fans say is only right if it crackles when the pot is turned. I also thought it was inherent to the circuit design . I read that the SHO was based on the pre-amp section of old mixing boards (I think) and they crakled like that too. My MI Boost 'n Buff also crackles when the gain pot is turned - I thought something was wrong with it until I found out about the "crackle okay" label on the SHO and assumed it was the same on the B'nB. So that's what Mr Vex says anyway. Here's a quick explanation, I'll provide a more detailed one later. 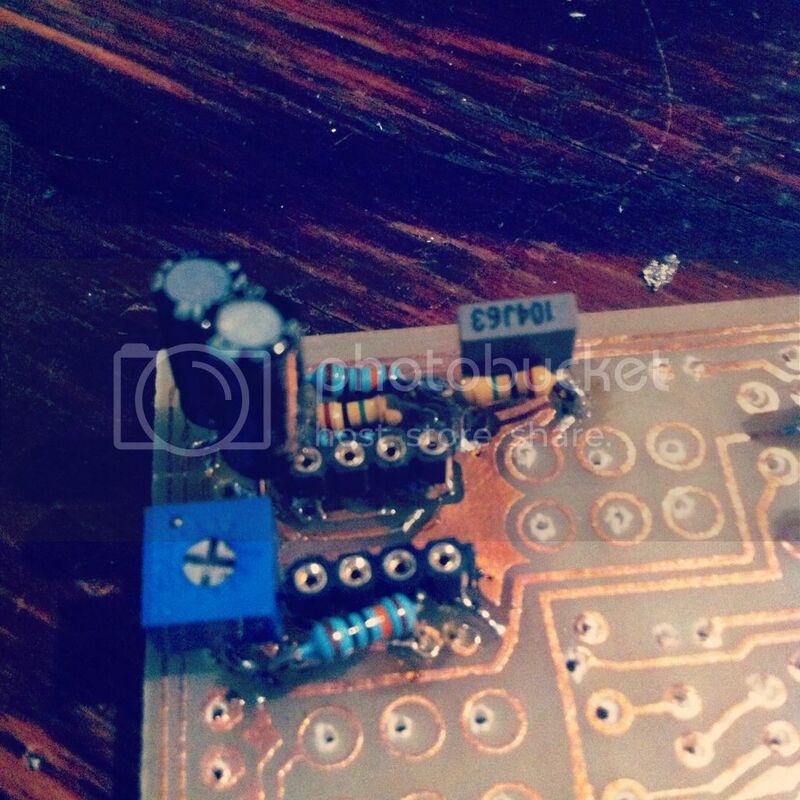 Essentially when setting the gain in this circuit, you can either adjust the Gate or the Source of the MOSFET. Each time the Source is adjusted, the transistor needs to rebias itself and it momentarily switches itself on and off - creating the crackle. By leaving the Source fixed and adjusting the signal at the Gate, it's not subject to this problem. It sounds identical to my ears but if anyone's interested I'll put up some sound clips using both approaches. Anyone wanna sell me a drill press? I see why you never hear the phrase "Yeah that guy is filthy rich! He made his money from.. building pedals!" Really is a labour of love. And it's a lot of labour! Still busy assembling the board. So far the buffer, boost and blend sections work fine. Building and testing each part separately as it's a complex build.